EXEL North America, Inc. – Manufacturer of SAMES Manual and Automatic Powder Coating Equipment and Solutions. To meet the requirement of companies looking to improve paint saving, SAMES has designed the InoBell®. The InoBell® is a high transfer efficiency applicator that offers extreme uniformity and high finish quality. One of the benefits of the InoBell® is that the spray pattern can be the size of 2 to 3 guns. 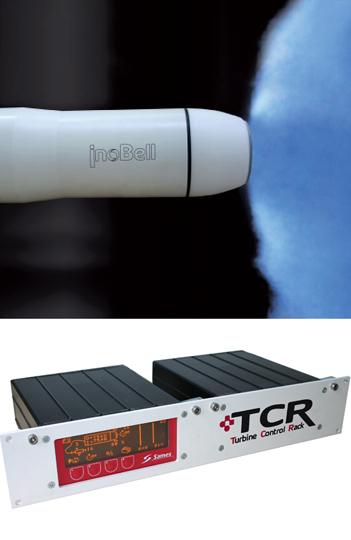 The powder flow of the InoBell® can be twice as much as a gun. Uniformity across the part is the best with InoBell®. Gun finishing can provide large fluctuations in film build. The InoBell® provides Excellent Regularity of Film Build – The quality of finish meets the most stringent and tight DOI criteria (quality of reflection). It also provides High Flow Rates and less applicators – just one powder bell can replace two guns as it can efficiently apply powder at flows in excess up to 30 kg/h. EXEL North America, Inc. has had a recent success using the InoBell® with an Office Furniture Manufacturer. We replaced (2) of their guns with a powder flow of 616g/min with (1) fixed InoBell® with a powder flow of 249g/min. The customer is also not reclaiming the powder. The outcome was that the customer had an improved finish quality, uniformity, and a 35% powder savings!! We have also had a few more success with the new SAMES InoBell®. To learn more about this great new product and its successes, please contact EXEL North America, Inc. at 1.800.573.5554 (USA) or 1.416.431.5017 (Canada). To learn more about this new innovative product, call us today!